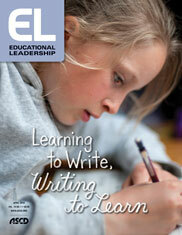 Writing enables deeper thinking and learning in every content area. Let's teach it in every content area. Having students write across the disciplines would transform K–12 education. If grounded in generous amounts of reading and discussion, this practice could have more impact on college and career success than any other factor (Conley, 2005). To achieve this transformation, we must first acquaint every educator with the ironclad case for all students regularly writing. Then we need to simplify and demystify the purpose of academic writing—and writing instruction—while helping practitioners see that generous amounts of writing doesn't mean onerous amounts of "paper-grading." If we do these things, the academic benefits will be swift and prodigious. Unfortunately, few teachers ever learn about writing's "incredible" power to "enable thought to operate much more deeply" on everything we read and learn (Walshe, 1987). Although teachers realize writing's general importance, most aren't adequately aware of the fact that higher-order, analytic thought likely isn't possible without engaging in some form of writing, or that we can literally "write our way" into a deeper understanding of complex texts or concepts that previously mystified us (Zinsser, 1988). Decades of research attest to writing's unrivaled ability to facilitate understanding and help people evaluate, reconstitute, and synthesize knowledge. Writing enables students to generate their best thinking in its most effective form (National Commission on Writing, 2003; Sundeen, 2015). That's why writing and speaking constitute the most sought-after skill set in business and industry and why many corporate recruiters rank these abilities twice as high as managerial skills (Hurley, 2015). Writing plays a more significant role in the school systems in countries that score high on PISA than it does in the schools in the United States (Darling-Hammond, 2010; Ripley, 2013). But extensive student writing is a frighteningly low priority in U.S. schools. For all the hype surrounding the Common Core standards in English language arts, the length, frequency, and quality of writing instruction have barely budged (Sundeeen 2015; Lee & Wu 2017). For instance, in one extensive five-state study, students received instruction in writing for only six percent of class time—and worse yet, most of that instruction wasn't in composing, but consisted of filling in the blanks, short answers, and the like (Sundeen, 2015). Written work? There hasn't been any written work at Rupert High for fifteen years! Maybe twenty! They take multiple choice tests. Reading comprehension. That's the big thing. We can change this reality by first deeply educating every prospective and practicing educator on the still-unsung impact of writing on thinking and learning, then clarifying some basics of interdisciplinary writing and writing instruction. Yes, English class is the primary province of writing and its instruction. But because of writing's intimate connection to generating and expressing new knowledge, teachers in every subject should master the rudiments of academic writing so they can guide students in learning those skills. Read texts—or examine data—for academic purposes by underlining, annotating, or note-taking as you read (an integral element of effective writing). Identify those notes, quotes, or underlined portions of text that best address the purpose of your analysis. Write to explore, clarify, or explain how those selected portions support your arguments, observations, and interpretations. As a former college writing instructor, I know that if my students had had a chance to master such fundamental skills in their K–12 years, it would have improved their writing, thinking, and academic capacities by orders of magnitude. David Conley's exhaustive study of college success (2007) confirms this. The experiences of a growing number of schools indicate that the impact of including writing in multiple disciplines could be both large and (nearly) immediate. View Park Preparatory High School in Los Angeles instituted a home-grown program to ensure that argumentative text-based writing occurred regularly in every discipline. In chemistry, for instance, View Park 10th graders write an argument about the primary causes of fish kills in a local river; in math, 9th grade students argue whether two different shapes can have the same area. With this all-school regimen, View Park rose to become the highest-achieving majority-minority school in California, with the highest test scores among black high school students in the state (Hernandez, Kaplan, & Schwartz, 2006). As View Park did, schools will need to more explicitly specify—and quantify—the amount, length, and frequency of writing assignments. This will vary by subject area. The guidelines can consist of specifications for everything from short one- or two-paragraph assignments to quarterly writing assignments that resemble what students will be asked to write in college. Writing—and practice with writing skills—can be easily integrated into the content areas by having students respond to simple, versatile questions, sentence stems, and prompts that have a bias toward argument.1 Notice how the following templates promote complex analytic thought—and address the Common Core's emphasis on writing that is "grounded in text" (Coleman, Pimentel, & Zimba, 2012). Evaluate/make arguments for the credibility or comparative superiority of ___ (a scientific theory, mathematical solution, politician, and so on). Explain why you admire/dislike or agree/disagree with ___ (a fictional or historical character, a musical epoch …). Analyze/interpret/debunk ___ (a math or science model or data table, a work of fiction …). Compare and contrast ___ and ___ (two musicians/artists, mathematical arguments, works of drama …). Make recommendations/propose solutions for ___ (some real-world quantitative problem or social/environmental problem). Variations on the above could be used to teach innumerable topics in any subject. I can tell you from experience and observation that students find such questions and prompts highly engaging. They activate the intellect and lend purpose to learning in every discipline—including math, where writing is essential but grossly underutilized (Burns, 2004). One study showed that when students had frequent opportunities to explain and problem solve in writing as they learned math concepts, the percentage who met or exceeded performance standards on the state assessment rose dramatically in a single school year (Zollman, 2009). Math: Make the quantitative case for living in Norway or the United States, based on your analysis of demographic data (see Hacker, 2016, p. 201). Art: Mary Cassat was/was not the greatest but most underrated impressionist painter. Explain. Literature: Who would make a better pet—Old Dan or Little Anne (from Where the Red Fern Grows)? Social Studies/History/Geography: Evaluate geographic factors that do/don't favor economic development for a country in sub-Saharan Africa. In urging more text-based writing in every subject area, we must address the issue that now silently suppresses the amount and frequency of writing that occurs in schools—the belief that more writing requires onerous amounts of paper grading. Individually correcting errors on student papers is among the least efficient uses of a teacher's time. The most powerful, time-efficient way to improve students' writing is through focused, whole-class instruction. Teachers should model one aspect of writing, with each step followed by student practice, during which the teacher observes (and addresses) whole-class patterns of progress or need on that writing skill. Effective teachers address areas where many student writers struggle by providing whole-class feedback, followed by more chances to practice, with additional feedback or instruction as needed. Teaching in this way is especially effective when grounded in exemplars of strong writing. Adopting practices like these will encourage more effective student writing in every course. But to close the loop, we must also establish the amount and frequency of writing assignments (Conley, 2007). Two enterprising middle school teachers at La Cima Middle School in Tucson (former colleagues of mine) built their own 8th grade English and social studies curriculum. It consisted almost exclusively of weekly readings, discussions, and writing one substantial argumentative essay per month, based on those readings. I watched one of these educators teach a focused lesson on writing a clear explanation of how a selected quote supports your argument. First, she modelled such an explanation aloud and on her overhead projector. Then, students tried writing an explanation for one of their own supportive quotes. As they wrote, the teacher circulated to "check for understanding" and identify patterns of struggle or success. She then returned to the overhead projector to more precisely address the pattern or problem—without ever collecting or correcting individual student papers. She repeated this cycle until every student (as far as I could see) had met the demands of that day's lesson. Further proof of how her approach improved writing came when I reviewed the students' completed papers—and when their state writing scores rose from average to first in the state. I've seen writing transform schools. When I visited Brockton High School—which had formerly been the lowest achieving high school in Massachusetts—former principal Susan Szachowicz explained how she and her faculty had created a curriculum that explicitly specified weekly and end-of-unit writing assignments grounded in content in every discipline. At the end of their first year of implementation, Brockton made the largest gains in the state on the Massachusetts Comprehensive Assessment System in every tested subject. During the next five years, according to Szachowicz, Brockton's emphasis on "reading, writing, thinking, and reasoning" took them from rock bottom to the top 10 percent of schools in the state, without any significant change in student demographics or faculty. Such evidence speaks plainly to how close we might be to achieving immense improvement in our students' academic and intellectual abilities. It's up to us to act on this evidence. For the sake of millions of students, let the writing revolution begin—tomorrow morning. Burns, M. (2004). Writing in math. Educational Leadership, 62(2), 30–33. Coleman, D., Pimentel, S., & Zimba, J. (2012). Three core shifts to deliver on the promise of the Common Core standards in literacy and math. State Education Standard, 12(2), 9–12. Conley, D. (2005). College knowledge: What it really takes for students to succeed and what we can do to get them ready. San Francisco, CA: Jossey-Bass. Conley, D. (2007). The challenge of college readiness. Educational Leadership, 64(7), 23–29. Darling-Hammond, L. (2010). The flat world and education. New York: Teachers College Press. Hacker A. (2016). The math myth and other STEM delusions. New York: New Press. Hernandez, A., Kaplan, M. A., & Schwartz, R. (2006). For the sake of argument. Educational Leadership, 64(2), 48–52. National Commission on Writing. (2003, April). The neglected "r": The need for a writing revolution. New York: The College Board. Ripley, A. (2013). The smartest kids in the world. New York: Simon & Schuster. Schmoker, M. (2011). Focus: Elevating the essentials to radically improve student learning. Alexandria, VA: ASCD. Sundeen, T. H. (2015). Writing instruction for adolescents in the shadow of the Common Core state standards. Journal of Adolescent & Adult Literacy, 59(2), 197–206. Walshe, R. D. (1987). The learning power of writing. English Journal, 76(6), 22–27. Zinsser, W. K. (1988). Writing to learn. New York: Harper & Row. Zollman, A. (2009). Students use graphic organizers to improve mathematical problem-solving communications. Middle School Journal, 41(2), 4–12. 1 See the section "The Special Place of Argument" in the Common Core State Standards for English Language Arts and Literacy, Appendix A, p. 24. 2 For other suggestions for reducing the paper-grading load, see Write More Grade Less at www.mikeschmoker.com/write-more.html. Mike Schmoker is an author, speaker, and consultant. He is the author of Focus (ASCD, 2011) and Leading with Focus (ASCD, 2016).